A year or so ago I had discussions with a number of local birders about Bittern and the fact there were supposed to be sightings on Bay Pond in Godstone - just a few miles down the road from me. I'd been down there a couple of times but had never seen one. It was all a bit cloak-and-dagger with the local Wildlife Trust, who were apparently reluctant to disclose the discovery, presumably because they didn't want a rare visitor disturbed. It might have been a local myth, for all I knew. Fine, I guess, keeping discoveries close to your chest if you don't want local yobs or egg collectors making a nuisance of themselves, but a balance needs to be struck whereby if you are interested in seeing and studying birds - and it's not as if a Bittern is so rare it is going to keel over and die and therefore disappear off the face of the British birding map if you happen to point a scope or binoculars at it - you should be allow to visit a site, that isn't on private land, and enjoy watching an unusual bird. The Wildlife Trust should make a point of letting birders know of such species. It's exciting news having a Bittern in the local area, for goodness sake! If they want people to enjoy visiting their wildlife sites, it's a bit pointless keeping what they've got there secret. The Wetland Centre at Barnes, for example, has had at least five Bittern at various points wintering there during the past couple of months, and people have able to view them. The cat is now out of the bag, however. 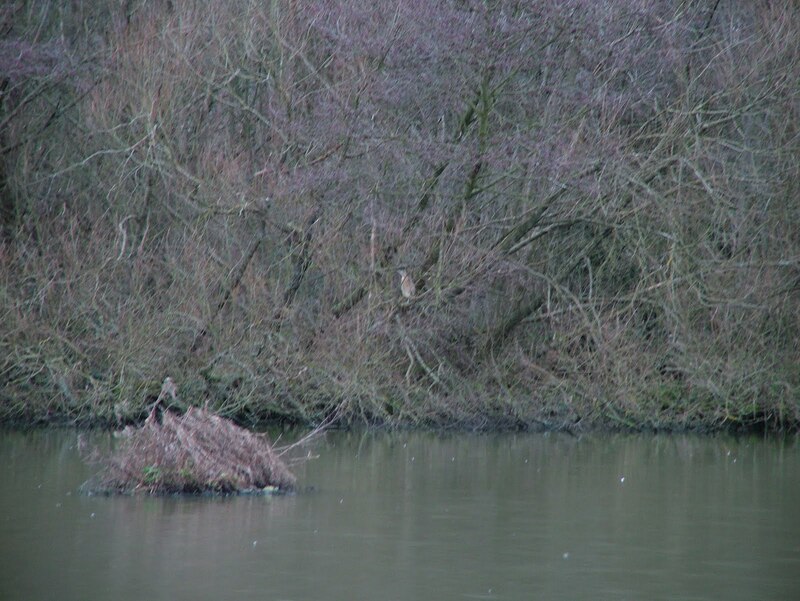 A couple of days ago, I noticed on the Surrey Bird Club website that a Bittern had been seen on Bay Pond. So late yesterday afternoon, I went over to have a quick look to see if I could find it. I bumped into an excited dog-walker, who regretted not having his camera with him because a Grey Heron was standing just a few feet away close to the footpath. 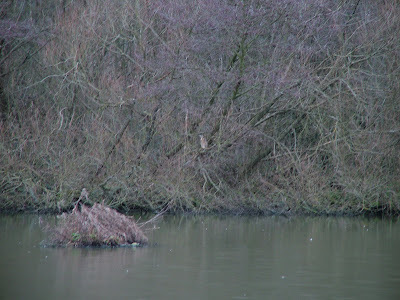 As I walked closer it flew over to the opposite side of the pond. I then noticed something sitting very still in the trees to its left. Perched on a branch as the light began to fade in the small trees opposite the footpath, and very easily seen by the general public if they knew what they were looking for, was a Bittern. The photo is very poor as it was too dark, but clearly this excellent bird hadn't been given notice that it was supposed to hide away from view. It is fantastic news to know we have such a great bird in the local area, and one can only hope at some point one or more will drop in at Holmethorpe, which has habitat which should suit them. The other good thing is it has saved me having to traipse off to Barnes to see one. Agree with your views entirely, Neil. As there is no public access to this site but adequate viewing from the public footpath, no disturbance of the bird should occur. Rather a nice Surrey tick for you. Bet we've already got one at Holmethorpe that's yet to be discovered - well, maybe! You make some good points there Neil and what a great bird in this part of Surrey! I've always felt much less of a connection with the Wildlife Trusts than the WWT or RSPB and think they may need to work on a few PR things. I'm tempted to go down for this Bittern, perhaps even tomorrow. Spot on David. Some Wildlife Trusts (not all) need to realise that they are missing out on increased membership by not making their reserves more user friendly and by seeing the public (including birders) as the enemy.